AMSTERDAM, THE NETHERLANDS, 10 February 2015 – Leading home automation, entertainment and control technology manufacturer, Core Brands (a Nortek company), announced today the latest subwoofer line from its Sunfire luxury subwoofer and home theater audio brand. The new XTEQ Subwoofers leverage new technologies to deliver the most powerful, clearest bass from the smallest enclosures in the industry. The new subwoofers will be showcased at ISE 2015 at stand 1-N70. Responding to consumer trends toward smaller, more powerful home theater subwoofers, the new XTEQ series offers integrators and consumers an unprecedented combination of incredible sound quality and small form factors that are ideal for any home theater or media room. The line includes three models that produce up to 3000W of crystal clear bass from 16-100Hz using diametrically opposing drivers, one active and one passive radiator. The 8-inch XTEQ8, 10-inch XTEQ10 and 12-inch XTEQ12 are housed in enclosures barely bigger than the size of the woofer diameter, with the XTEQ12 measuring just 13.5”(W) x 13.5”(H) x 13.5”(D). The Sunfire XTEQ8, XTEQ10 and XTEQ12 subwoofers will retail for $1,500, $1,750 and $2,000, respectively. Each model leverages Sunfire’s exclusive Tracking Down Converter™ amplifier design. The drivers all feature the latest improvements of Sunfire’s renowned High Back-emf design, and to best accommodate the longer ‘throw’ of the XTEQ woofers, all feature Sunfire’s unique Asymmetrical Cardioid Surround design. 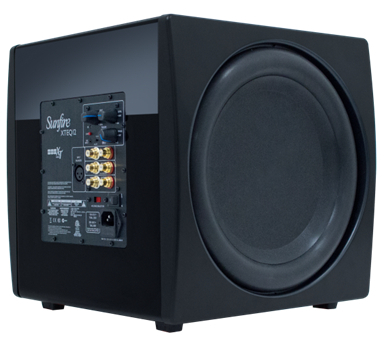 The subs also leverage the latest in Sunfire’s auto equalization technology to tailor the subwoofer output to compensate for any room’s acoustic anomalies. Each model is built to be used in both 110-volt and 230-volt installations. Premium audiophile features include multiple turn-on options (auto audio sensing and 12 volt trigger activation), plus soft-clipping amplification, anti-walking treads, variable crossover and phase control. The XTEQ subwoofers include RCA line in/line out and slave connections making it easy to pair two subwoofers, with XLR connectors for pro applications. Integrators can perfect and dial in the sound for any room through continuously variable frequency and phase adjustments for both the low pass and high pass crossovers. The new XTEQ line is now shipping.